He knew that children are not born theologians who can grasp the intricacies of the great mysteries of Faith at an early age. The Faith needed to be lovingly spoon-fed to them, and so the childlike customs of Christmas were for him tailor-made to instill love for the Faith before children were old enough to even begin to understand it. What a shame it is, then, to see well-meaning traditional Catholic parents discarding those customs altogether in a misguided effort to counter the commercialization of Christmas. No gift giving, no merry making, no feasting on Christmas. Alas, the baby is being thrown out with the bathwater. In a dreary world where pessimism and cynicism—rather than righteousness and peace—have kissed each other, we must guard against robbing our children of the wonder and joy of Christmas— the seedbed for a child’s Faith. Our poor children may live long enough to see Christmas outlawed altogether in our brave new world, even as it was once before by the Pilgrims who invented Thanksgiving out of contempt for the “popish” feast of Christmas. Anti-Catholics have long sought to destroy our great Feast, which is why we must be certain that in our eagerness to oppose the commercialization of Christmas, we don’t become Puritanical agents working towards the same diabolical end! It all began in Advent, when my seven sisters and brother were expected to prepare for the coming of Christkind (pronounced Kris-Kint). Under Mother’s watchful eye, we’d fashion a small, makeshift manger that would remain unoccupied until Christmas Day. As Advent progressed, good deeds were encouraged on a daily basis; and each time it was determined that a good deed had been done, one piece of straw was placed in the empty manger, the idea being that Advent was a time to prepare a bed on which the Baby Jesus could sleep when He arrived. 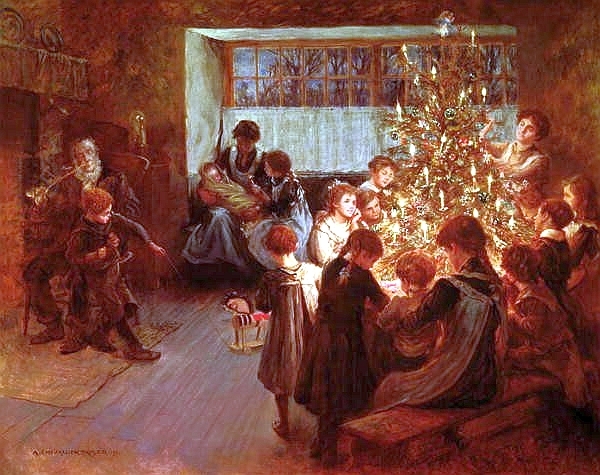 Under the rules of the old custom, the practice of virtue was an essential part of a child’s preparation for Christmas. Each night after supper, the lights would be turned down while Advent Wreath candles were lit. The haunting strains of O Come, O Come, Emmanuel would be lifted (somewhat awkwardly, I suppose) on the voices of children. Shadows and flickering flames played on faces across the dining room table, making it easy for a child to imagine that he sat with the Israelites of old waiting for the Messiah to come. As the four weeks passed seemingly as slowly as those four thousand years, one question became constant: “Have my sacrifices been enough to please Christkind?” And thus the weeks of Advent were spent in preparation and waiting...as they should be. Gradually, the empty manger would fill with straw as the stage was set for a celestial Visitor. On the evening of December 23rd, my father would hang a curtain over the doorway of our living room, which, if that straw was piled high enough, was to be transformed into the “Christmas room” by the Baby Jesus Himself in the middle of the night. Then, it was off to sleep, a seemingly impossible prospect. All day long, we weren’t allowed to go near the curtain, lest one of us should succumb to the temptation to “peek”, which would be to risk the instant disappearance of whatever Christkind may have brought. A lifetime of self-discipline was taught between dawn and dusk on Christmas Eve. Breathlessly, we’d make our candle-lit procession from the back room to the living room, singing the words of the old German carol as we went: Ihr Kinderlein, kommet, O kommet doch all! Zur Krippe her kommet in Bethlehems Stall. I can still see the cast of Bethlehem bathed in a warm, peaceful glow, seeming as real to me as if I were a shepherd boy looking down from that hillside over Bethlehem. I can hear my father and mother’s hushed voices as they prayed and sang to the same royal Baby that shepherds and angels had adored centuries ago. That sacred moment was like a porthole in time, where traveling back to the city of David just then seemed not only possible to a child, but imminent. Those long ago Christmas Eves remain vivid in my memory, thirty-five years later. And the gifts under the tree? I don’t remember many of them. There was no question what Christmas was about—we could feel it in the depths of our young souls; we could see it in the tears that formed in our father’s eyes as he prayed aloud; we could hear it in our mother’s voice as she sang softly—silent night, holy night, all is calm. Christmas was about the Baby, Mary, Joseph, shepherds, angels and Bethlehem. It was something so powerful that it could even cause our father’s voice to tremor in the darkness as he explained Who the Baby is and what He expects of us. We knew that Christkind was real because our father and mother were kneeling on the floor before the manger… praying to Him. Moments later, the magic of Christmas—the feast, the Catholic family celebration—burst forth in jubilation. The majestic tree was lit; there was singing and dancing; bowls of nuts and candies, specially delivered by the Baby Jesus Himself, seemed to appear out of nowhere. And there, under the tree were the gifts, the second-to-last phase of the ritual. He’d come. He’d brought little rewards for Advent efforts. The family was together, united in love for each other and a Child King we cherished with all our hearts. You must understand, my parents had no money. And yet, somehow, Christmas came, year after year, and it was fit for a King! That was part of the miracle. But this was just the beginning. The toys and good things to eat were set aside to be enjoyed on each and every one of the twelve days of Christmas. Now, the soul of Christmas Eve was about to be celebrated. Coats and hats, mittens and scarves were the next order of business. The old station wagon groaned in the frosty night air as Father turned the key in the ignition. Nine children were loaded up, and, moments later, the little ones peered through frosted glass in the hopes of catching a glimpse of Bethlehem’s star on the way to Midnight Mass. It would be Christmas Day before this night would draw to a peaceful close in a dimly-lit church filled with the scent of pine needles and candle wax and incense. Not long before the first light of Christmas Day glowed in the East, sleepy children would crawl into chilly beds as content as ever a child could be this side of Heaven’s gate. And, why not! Christ is born! The years have passed by so quickly since those childhood days that I can scarcely believe that the five little ones who process into my living room each Christmas Eve are my own, that my beloved father and one sister are no longer with us, and that the rest of us have aged more than we care to admit. But, strangely enough, the Baby Jesus remains unchanged and unchanging. Ever young, ever new, He’s the same now as He was then. My children’s imaginations are as captivated by Him now as mine was then. Life is moving on, but somehow Christmas is the one thing that stays the same. Needless to say, His midnight visit on Christmas Eve is the highpoint of the year for my children. Why? Because, as I see it, this old European Christmas custom is profoundly Catholic. There is nothing plastic-banana or phony-baloney about it! Children are neither taught to equate Christmas with wicked consumerism or Godless Puritanism. They are taught the mystery of the birth of Christ and the importance of celebrating the Feast. Advent is a most essential part of the process, even as Midnight Mass is its climax. Even now, my own children—walking in the footsteps of their little Catholic counterparts from the old world—are trading daily acts of kindness and virtue for little pieces of straw that are lovingly tucked away into an empty manger. For one night soon the Child of Bethlehem will transform their home and their souls into a place fit for a King. For a few miraculous moments, life will stand perfectly still and the line between the physical world and the spiritual one will become mercifully obscured. Christkind creates in children an indissoluble bond between the joy of Christmas—which celebrates His birth—and the Catholic Faith itself which is His greatest gift. In real Christmas cheer the two become one, and the proper celebration of the Holy Day plants seeds of Faith in the little garden of children’s souls even as they shout for joy. As they grow older, their faith in Christkind transforms itself naturally into belief in the Real Presence of Christ in the Blessed Sacrament—the true meaning of Christmas. There is no deceit in the Christkind custom, for, indeed, there is no deceit in the Christkind. He does come down to earth on Christmas Eve; His providence provides everything we need in this life; and He exists just as surely as we do. He was born, He has a mother whom we all know and love, and He comes to us often at Mass—Christ’s Mass. He comes to us at Christmas. Has fallen man ever had more reason for Feast or feasting than this? Let us be glad and rejoice. Merry Christmas to one and all! Christ is born! May the grace of Christkind be with all the readers of The Remnant this Christmas, and may He bless one and all with a happy and holy New Year!